The other day I had a lovely lunch on the balcony next to my office with two late stage ANU PhD students. We enjoyed the late winter sun and the view of Black mountain Tower while the ANU Quidditch team frolicked on the oval in front of us. It was one of those moments where academia feels just like paradise. Where else do you get to work in the middle of an enormous park, surrounded by smart people doing interesting things – and where people can run around with broomsticks between their legs without ridicule? I remarked that the lovely ANU campus must surely be one of the perks of being a PhD student here and my lunch companions agreed. One admitted that it was pretty tempting to draw the process out as long as possible because, all too soon, adult responsibilities will come crashing back in. If you don’t mind living on a low income (or can supplement it somehow) being a full time student on a living stipend in Australia is (superficially at least) a pretty good deal. At the moment unis don’t charge residents any fees (the government is proposing to change this), so there is no worry about wracking up future study related debt (personal debt is, of course, a different matter). As long as you are progressing your work and you don’t have a lab schedule (or a bully for a supervisor) your schedule is your own business. You could, if you wanted to, work in the middle of the night and sleep all day. The situation I am describing is about as far away from most of the capitalist world as you can be, while still enabling you to enjoy many of its advantages. So it’s tempting to think that the 50% or so of people who finish late must do so because they are taking advantage of this nice lifestyle. But in reality of course, most people in this situation are desperate to get the PhD monkey off their back. Living below the poverty line as an adult is no fun, research can and does cut into your social life and most research projects get at least a little bit boring after three or so years. There is, however, a puzzling group of people who are reluctant to submit even when their life as PhD student is becoming untenable. Money is running out, relationships are strained and yet the person seems ‘stuck’, unable (or unwilling) to take the steps they need to get to submission. You might have met this person yourself: there’s always another chapter that needs writing, or more literature to read. Sometimes a picky supervisor is to blame – but I meet far more dead set pragmatists than perfectionists in the supervisor community so I’m not sure this happens as often as people think. For an unfortunate few students, the prospect of actually getting their work to a PhD standard has become remote, yet still they refuse to acknowledge that it might be time to give up. There are some people I know who are essentially living in limbo, refusing to make a decision, while everything collapses around them. While it’s painful and frustrating for me to watch, I’ve learned the hard way it’s best to keep my mouth shut and let them work it out. Judging them and offering advice that they can’t – or don’t – want to follow is not going to help. Why do people chose to persist when the rational, sensible thing to do is just hand it in, or walk away? The reasons are complex, but I think in some cases there’s troubling identity issues at play. At a conscious or subconscious level, the person is worrying about who they will BE without the label of ‘PhD student’. The prospect of giving up this identity, especially if there is not another to readily replace it, can provoke a full blown existential crisis. We shouldn’t be too quick to jump in and blame these lingering students for their inertia. The late, great Alison Lee did some of her best work in this area, starting a trend for scholars of research education to look closely at the role of identity and identity work in PhD communities. My friend, Dr Mary-Helen Ward wrote a whole thesis about PhD pedagogy, which contains a comprehensive literature review of this area if you are interested. In our work obsessed western societies our sense of identity is so entangled with our jobs that these identity issues are very real and troubling for many of us. 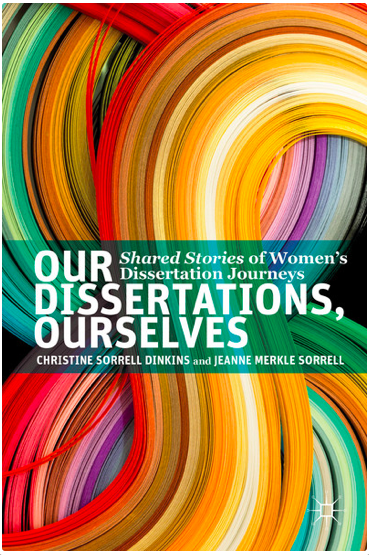 A new book called “Our Dissertations, ourselves” by Christine Sorrell Dinkins and Jeanne Merkle Sorrell has some interesting perspectives to offer on identity troubles. I suspected, given the title’s amusing reference to the classic “My mother / myself” by Nancy Friday, that the book would concentrate on women’s experiences and I was right. The authors interviewed a number of women about their dissertation journeys for the content and have organised the chapters to echo the key problems of studenthood: writing, isolation, relationships supervision and so on. There is one of the best discussions of imposter syndrome in here that I have seen anywhere. At the end of each chapter is, what I think, is the most useful, practical aspect of the book. Aseries of questions are offered to help you explore issues are playing out in your life and think about what you might be able to do about them. Overall this is a useful and interesting book, but I do worry whether the potential audience(s) for the book will be that interested in reading it. Most students seem happy enough to carry on managing their personal lives and thesis troubles without any help at all. Those who are interested in using stories as navigation aids will find plenty of examples on this blog and many of the PhD student blogs I link to – for free. The analysis of the stories in ‘Our dissertations, ourselves’ tends to be quite theoretical, which might turn off some readers without a humanities background and the emphasis on womens’ experiences might turn off some men who, if our numbers are anything to go by, might need this sort of book more as they drop out at a higher rate (hint to the publisher: I’d love to see a follow up focussed on men please). Another obvious audience is supervisors and I would strongly encourage those of you who are already supervising, or soon to become supervisors, to get hold of it and read it. One of the problems with supervision is that we often have a limited sample set of students on which to base our practice. Books like this provide plenty of case studies that can enrich our supervision practice. However, again, most supervisors seem to carry on without any help or much reflection on their own practice. I hope that at least some of them discover it and their students get the benefit. So what do you think? Have you met anyone who has delayed their submission to the point of pain? Are you finding ways, unconciously or not, to sabotage your own timely completion because you are worried about what happens next? Do stories of other people’s success help – or not? Interested to hear your thoughts in the comments. This entry was posted in Book Reviews and tagged book review, failure, identity. Bookmark the permalink. Just finished my PH.D. I think time just passes and the work consumes you…. But then one day you realize you did all you could do and your work is done. So true of how I have been feeling. I am holding on to my PhD submission but I do not know why really. I am definitely going to have a read of this book. I knew someone who dithered around, taking 12 years, and then gave up, and another who took 25 years part-time but eventually finished. I suspect these people have the misapprehension that their PhD has to solve all the world’s problems (where in fact it does not even have to “solve” one), and they are perfectionists. It’s an understandable thing to get lost briefly in the PhD slump, but after a while it begins to look pathetic. Thanks for the mention, Inger. I think the book title also refers to a seminal work of feminist health from the early 70s: Our bodies, Ourselves: http://en.wikipedia.org/wiki/Our_Bodies,_Ourselves (which was also a strong referent for Nancy Friday). I think the reasons that people find it difficult to finish a PhD are complex, and endlessly interesting. My MA thesis supervisor, who was a writing teacher, used to say “Don’t get it perfect, get it finished”, but I think the mystique surrounding examination is part of the problem people have – what if it’s not good enough *yet*. My view is that examiners will almost always ask for more work to be done, so you might as well get on with it and find out what that will be. You hit the nail on the head when you stated that the obvious audience for this book is students and supervisors – who do not want/are not ready to admit that they need help in moving forwards. The key question is how do we overcome this aspect of humanity and the human condition? Fantastic post Inger @thesiswhisperer. I think everyone’s reason is different but self-sabotage is the demon for me. I look forward to reading the book when I finish my thesis (which is very soon..don’t ask!). I have a number of friends currently doing PhDs in various very clever areas who oscillate wildly between jubilation and despair. One (a molecular biologist) insists I should do a PhD while begging for the sweet release of death or submission in the same breath. I feel like I should read this book. Yes I’ve met a couple of these. Myself I am keen to finish. I personally already have a working life separate from study and I see my PhD as a vehicle for better employment. I handed my PhD in last month… I had organized a party, “end of PhD, 40th”, 3 months prior I forced myself to hand in my PhD even though I thought it wasn’t ready. My supervisors said it was ready! Plus I wasn’t going to have a fun 40th with a PhD over my head! I always thought I’d never do it…so if I can so can you. Just write, write, write…and maybe plan a party!!! And I just realized I’m offering unhelpful advice…so this is really for people who haven’t reached “that stage” yet. Imposter syndrome is me all over, plus having a supervisor team of superacademics who make me feel very inferior. Hate statistics. I have it all there, I just need to write it, but I think I should change direction and write a thesis on procrastination/avoidance techniques, ‘cos I have practiced them all!